A stifled housewife rekindles her passion for life with a new love, jigsaw puzzles, in Marc Turteltaub's new drama "Puzzle." 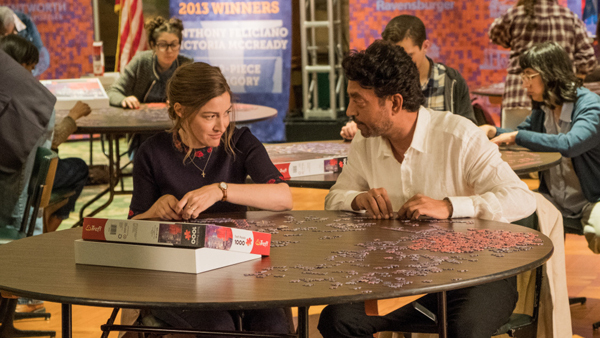 Kelly MacDonald ("T2 Trainspotting") plays Agnes, who lies to her family in order to join a national puzzle tournament with an unlikely partner, a rich inventor played by Irrfan Khan ("Life of Pi"), and has to decide how much she wants to change her life. In his review at The Wrap, William Bibbiani says that "Puzzle" is "undeniably satisfying," praising the film's "quiet, zen-like" storytelling and, in particular, Kelly MacDonald's "superb" performance.